21430: Acronis Cloud Backup: Backup to Acronis Cloud Storage Fails with "The certification server is unavailable"
The Acronis Online Storage certification server is temporary unavailable e.g. due to a short-term maintenance. Please reattempt the backup in ten minutes or later. 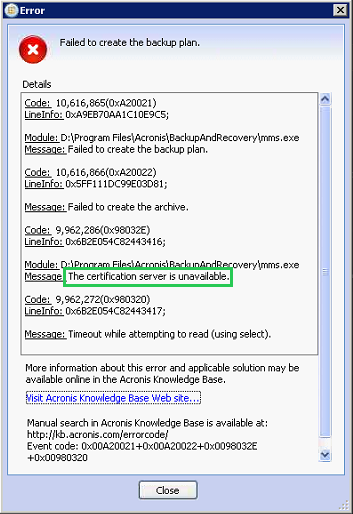 Should the error reappear regularly, please check the connection with Acronis Cloud Connection Verification Tool.